Dramatic play enhances childhood development in four major areas: social/emotional, physical, cognitive, and language. At Kaplan, our aim is to supply caregivers and preschool teachers with the materials, props, and staging necessary to set the scene for children. Engaging in healthy pretending helps children understand the world they live in while strengthening personal skills and friendships. 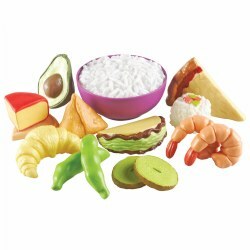 Our dramatic play materials range from life-like baby dolls and animal playsets to realistic play food and kitchen sets. 2 - 5 years. Order up! 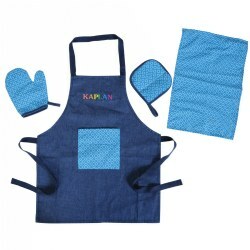 Children will feel like a world-class cook while serving favorite recipes to their friends. A sturdy denim apron has a handy, colorfully designed front pocket and a hook-and-loop tie that attaches at the side for easy access. A matching dish towel, oven mitt, and pot holder complete the set. Machine washable. 18 months & up. 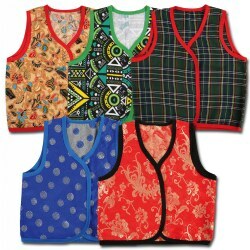 This set of five multicultural vests offers a collection of patterns and materials from around the world. Around the age of two, children begin to notice differences such as gender and hair color. This is an opportune time to share examples of diversity in an effort to teach children to respect, accept, and celebrate diversity. Acceptance of these differences helps children realize we are all humans despite what we wear, how we talk, and our physical traits. 3 years & up. 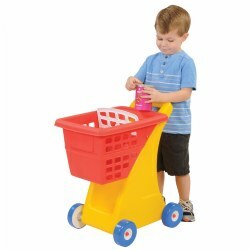 Colorful grocery cart is great for pretend play. Children can transport whatever they can fit in this pint-size carrier. Features a soft basket and a wooden bottom shelf to fill with play food, toys -- whatever they want to roll around! Cart is crafted of FSC certified wood from sustainable forests and colored with safe water based paint. Cart measures 16 3/4"L x 11 3/4"W x 19 3/4"H.
18 months & up. This adorable, soft-bodied baby is perfectly sized for little hands and arms to hold and hug. Features vanilla-scented head, arms, and legs, and eyes that close when the doll is put down to sleep. Designed in France. Doll measures 12". Included: Calin Mila doll with headband and cute pajamas. 3 months & up. 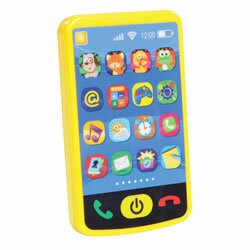 Little ones will flip over this phone that features fun sounds, greetings and phrases and a Spanish mode that encourages bi-lingual learning. 3 button cell battery included. Available individually or in a set of 2. Colors may vary. 18 months & up. These dolls feature sweet expressions, soft huggable bodies, and a one piece romper. A perfect doll for little ones to love, feed and sing to sleep. 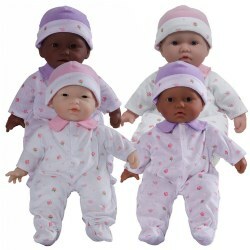 Ethnic dolls include African American, Caucasian Asian, and Hispanic. Outfits may vary. Dolls are 11" long. 18 months & up. 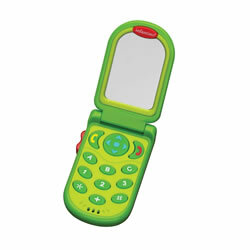 Toddlers will enjoy this smartphone designed just for them. Features 16 icons (each with its own sound), on/off button, and low volume to protect hearing. Set of 2 phones. 2 years & up. Children will enjoy preparing and serving some of their favorite foods while also being introduced to popular new cuisine. The authentic appearances of these foods invite children to share many meals and snacks with their friends. Bowl of rice measures 4" in diameter. 18 months & up. 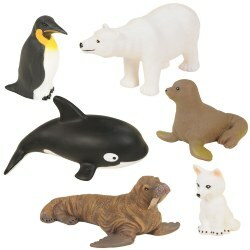 Lots of details, super soft plastic and friendly faces will make this animal set a favorite in the classroom. Great for supporting classroom themes, role play, and language development. Animals measure approximately 3 3/4"L x 3 3/4"H.
2 years & up. What fun children will have as they discover the animal kingdom through the eyes of the many animals in this jumbo animal set. Children can imagine the lion roaring through the jungle, riding a horse on the farm, visiting the animals at the zoo or taking care of the many pets at home. 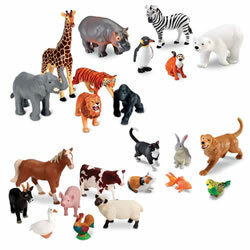 Animals measure between 3 3/4" H x 7 1/2" L to 13" H x 11"L and are made out of durable, non-toxic plastic. 18 months & up. The arctic animals in this set are detailed in texture, traits, and size. Children will enjoy learning about each of the animals through engaging, hands-on learning experiences. Each set comes with six animals and an activity guide. 2 years & up. Encourage compassion and participation in pet care responsibilities. 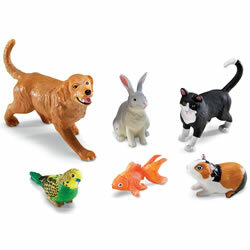 Set of six popular pets includes dog, cat, rabbit, guinea pig, fish and bird. Pets measure 3 3/4" x 7 1/2"L and are made out of durable, non-toxic plastic. 2 years & up. What do the animals say? What are their names? These are but a few things that can be discovered playing with this farm themed set. 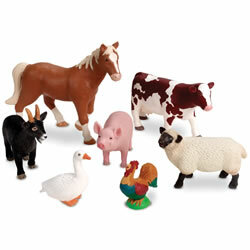 The set includes the most popular farm animals - pig, horse, cow, goat, sheep, rooster and goose. 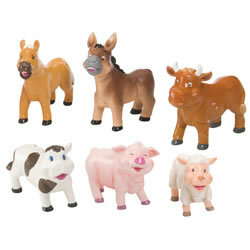 Horse measures 10"L x 7 1/2"H. All animals are made out of durable, non-toxic plastic. 2 years & up. Roar like a lion or move across the tree tops while imagining you are in jungle with your jumbo jungle animals. 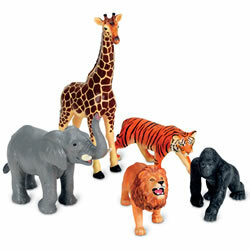 Include a set of 5 of the most popular animals - lion, tiger, elephant, gorilla and giraffe. Giraffe measures 13"H x 9"L. All animals are made of durable, non-toxic plastic. Birth & up. 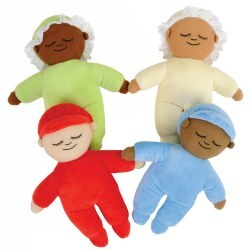 Celebrate diversity with these huggable fabric dolls. Sweet, sleeping faces make them fast friends! Machine washable. 10" tall. 2 years & up. 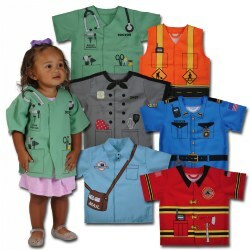 Pretend shopping is learning through role-play. 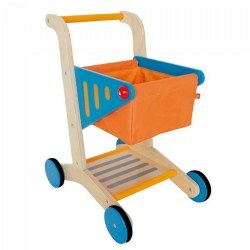 This durable shopping cart will hold a basket full of play food and other important items that make up the shopping list. Special wheels won't scuff the floors and can be used inside and out. Shopping cart measures 9.4"W x 15.9"D x 22.4"H. Play food and accessories sold separately. Birth & up. 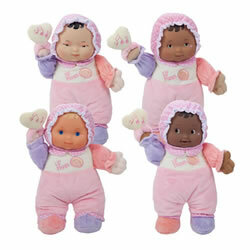 Cuddly and soft, these baby safe 12" soft body dolls help develop motor skills and eye-hand coordination. Each doll has an animal shaped rattle in one hand and a crackle sound in the other to stimulate the senses of sight, hearing and touch. Color and fabric may vary. Surface washable. 2 years & up. 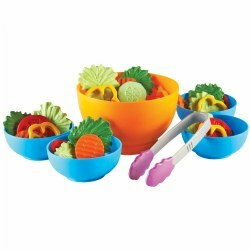 Encourage healthy eating and teach the concept of serving and sharing with this pretend salad set. Includes 38 pieces and enough vegetables for four servings. The perfectly sized children's tongs help with fine motor skills and act of serving strengthens eye-hand coordination. Includes 12 lettuce leaves, 4 tomato slices, 4 cucumber slices, 4 carrot crinkles, 8 pepper rings, and a larger serving bowl with 4 smaller individual bowls and a pair of tongs. 18 months & up. Children can nurture and cuddle their dolls in soft comfort as they interact and build social emotional skills. 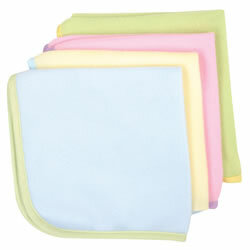 Includes a set of 4 - 18" x 18" blankets in four pastel colors. Machine washable. 2 years & up. Learn to count with these treats! 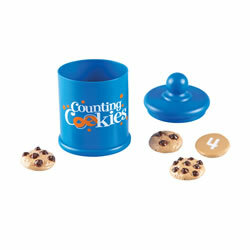 Includes plastic cookies with raised chocolate chip pieces to count and the corresponding number on the opposite side. Includes a decorative cookie jar for storing and display. 18 months & up. Mealtime is a fun time with all these essential play props to feed your hungry doll. Set includes: bib, bottle, feeding dish with spoon and sippy cup. Cut out the back of the packaging for the perfect sized placemat. Sized for most 12" dolls. Fabric may vary. 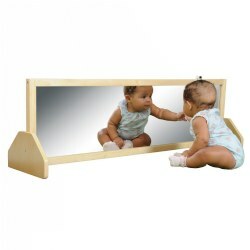 Hang this acrylic mirror in the dress-up room. Hardwood frame with removable legs for optional wall mounting. Write-on wipe-off board on mirror back. Feet can be attached for vertical or horizontal use. Measure 48" x 14". 18 months & up. This soft kit has everything a little doctor needs for those important house calls. 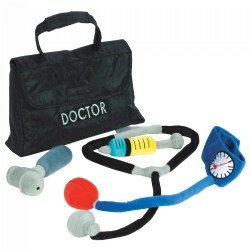 Doctor kit includes: reflex hammer, stethoscope, syringe, and blood pressure monitor. A convenient doctor case with snap closure is also included for storing a transporting equipment from appointment to appointment. Spot clean only.